Clinton Cerejo’s Life Sahi Hai is very Wake Up Sid in its sound, but works nevertheless due to the general agreeability of the arrangement and a dependable set of vocalists in the form of KK, Vishal Dadlani, Sidd Coutto and Benny Dayal. The composer next offers a Punjabi track Ishq Na Kariyo Kakke sung by Mika Singh and Earl. The orchestration surely has more richness than the general run-of-the-mill Punjabi tracks, but with the flipside that it ends up being cacophonous at times. Should work with the masses nevertheless I guess. Clinton’s last offering for the soundtrack as composer is a revisit version of Koi Aa Raha originally composed by Hitesh Sonik. And this happens to be Clinton’s best work for the movie, a beautifully breezy track sung by Sonu Nigam, Neuman Pinto and Rachel, which though by name a revisit the composer makes his own with some splendid rock-based arrangement. As said earlier, the original version of Koi Aa Raha brings into picture the second composer for the soundtrack, Hitesh Sonik, who recently debuted with that wonderful soundtrack for Stanley Ka Dabba. And the arrangement of the acoustic track is spot on, kudos to the guitarist. Not that upto the mark is surprisingly Suraj Jagan on the vocals, who doesn’t quite sound his best singing this. The composer brings back Clinton to deliver the sinister rock Baanwre, easily the best track of the album. The arrangement here too is brilliant, the use of guitar once again exquisite. And Clinton makes no mistakes on his part. The director Luv Ranjan takes on the role of music director with Kutta, the only one to have appeared on TV yet. Interesting elements in arrangement, though overall didn’t find it very impressive. Mika Singh does his part well nevertheless. The soundtrack comes to a close with a party track Chak Glassi which works as it should, in its foot-tapping-ness and noise levels. Suzanne D’Mello and Monali Thakur render it with matching exuberance. The Ad Boyz version is as good as the original. 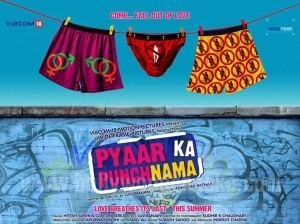 The kind of movie that Pyaar Ka Punchnama seems to be going by initial feelers, its soundtrack definitely exceeds expectations, thanks mainly to Hitesh Sonik who continues his form from Stanley Ka Dabba, and Clinton Cerejo who is only on his second outing as composer after that one track for Jawani Diwani and shows every signs of establishing his mark here too after succeeding in music production and singing.